We don’t know about you, but we would walk backwards to Ballygally for a bag of Tayto Cheese and Onion Crisps. We love the jolly little face of Mr Tayto on the yellow packet ; the rustle as you prepare to rip it open and munch your way to happiness. That said, we can totally cope with newer ranges like Rough Cuts, handcooked flavours like Sweet Chilli and Red Pepper and good old Onion Rings. If we’re feeling virtuous, we’ll go for the lower calorie Advantage range. They’re all utterly yummy. Naturally it takes a lot of potatoes to make the most popular crisps in Northern Ireland. 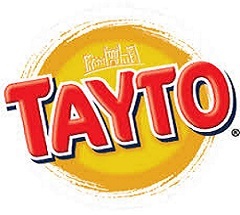 They store them in 1 tonne wooden boxes at Tayto Castle, before they clean peel, slice, fry, flavour and pack them. Those spuds come from local farmers. They’re a proper Taste of Ulster.